I never tire of venturing out into the snow to see who has passed by. This snow is especially cold, dry and crystalline so details of toes and claws are sharp. 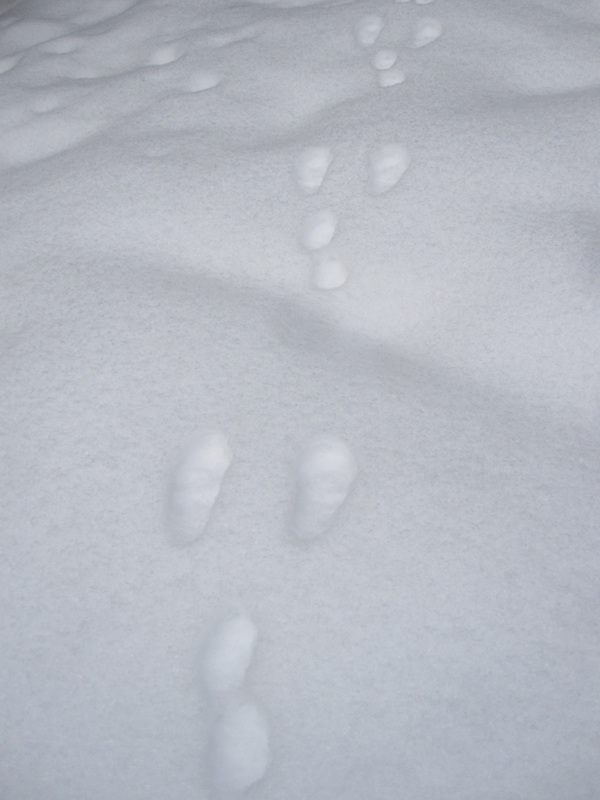 Snowshoe hare tracks are a bit deceptive, since the hind feet appear to be in front. But imagine how a rabbit moves–the front paws go down to steady the body as the strong hind legs hop forward. Following the tracks, it is not so difficult to picture them lolloping along. My own tracks have been lolloping along too, as I wander through a low-key winter. The writing has been on a hiatus as I tinker in the new studio space. It’s a time of exploration after years of keeping creative projects confined to a small corner of a small house. Now I can spread out. The watercolors and I are renewing our long acquaintance, and it’s a happy reunion. At least for me. It’s my intention to return to regular posts here as spring approaches. One of the things I’m enjoying about being back in snow after a ten year hiatus is the tracks. large & small — such clear evidence that someone has passed by.